The soup course for Warren’s 49th Birthday had to be something new and different. 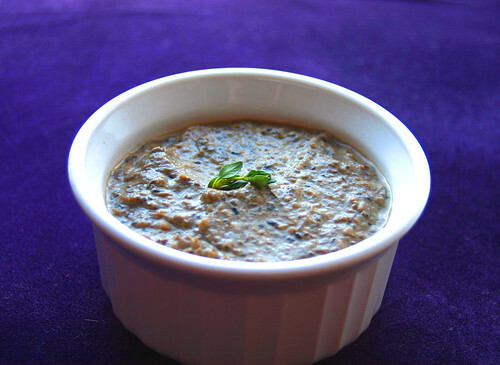 Looking in my stash of recipes not yet tried, I found this Mushroom Bisque I’d been dying to taste. So many flavors, and such great texture. Plus, you can make it a couple of days ahead of time and let the flavors meld together. When throwing a dinner party, it’s always best to find recipes you can start ahead of time so you’re not completely strung out when your guests arrive. You want to be a part of the party! This is another from Oprah Magazine, adapted from Susan Spungen’s Recipes: A Collection for the Modern Cook. 1. Bring 2 cups of water to a boil. Place porcini mushrooms in a large glass measuring cup. Pour boiling water over mushrooms and set aside. Wash and trim fresh mushrooms; cut into quarters and set aside. 2. Heat oil and butter in a 4-quart stockpot over medium heat. Add shallots, pinch salt and pepper, and rosemary. Cook over medium heat, stirring occasionally, until shallots begin to brown, about 7 minutes. Add celery and continue to ook until translucent, about 2 minutes. Add fresh mushrooms and generously season with salt and pepper, stirring frequently for about 5 minutes, until mushrooms lose approximately half their volume. 3. Using a slotted spoon, remove porcini mushrooms from water and add them to stockpot (save the water). Increase heat to medium high and add Marsala. Cook 1 minute. 4. Slowly pour porcini liquid into stockpot, leaving any sediment behind. Add potato and chicken broth and bring to a boil, then reduce to a simmer and cook until potatoes are tender, about 20 minutes. Turn off heat and let soup cool slightly (about 8 minutes), stirring occasionally. 5. Using a standard or immersion blender, puree soup until smooth. If using a standard blender, puree in small batches to prevent spillage. Transfer to a clean pot or storage container. Soup can be refrigerated for up to 2 days or frozen for up to 2 months. 6. When ready to serve, reheat soup and add thyme and milk; stir well. Use additional milk or chicken broth if soup is too thick. Simmer 5 minutes and adjust seasoning to taste. Turn off heat, add Madeira, stir well, and serve immediately. I love anything with mushrooms and mushroom soup is one of the ultimate comfort food. I like the idea of letting it stand for a while for the best out of the flavours. I love hearty-creamy-brothy soups like this, especially in the winter! I love mushroom soup and this looks amazing! I love all types of mushrooms, whether fresh or dried. This one just looks very delicious to me. Have to give it a go. Last time I made mushroom bisque it shot out of the blender all over my kitchen ceiling(I still have the stains to prove it!!) Ill try your recipe and be more careful this time. Funny how those memories of splattered food stick with us (and onto our ceilings and walls and floors…). This mushroom soup sounds so good! This mushroom bisque looks incredible! The texture and the flavors sound fantastic!